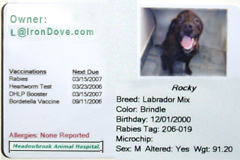 What in the world would my dog need a picture ID card for? I'm having a little trouble with this one. It freaks me out that my vet would spend the time and money to do this. What is really going on here?